For several years, I’ve been discovering treasures on E-bay. I’ve bought everything on there from my wedding dress to furniture to cylinder heads for Motor Man’s racing engines. One of my favorite things to find are items pertaining to this area of Virginia where I’ve always lived. Last week, I discovered three yearbooks from the school I attended. I was in elementary school in the most recent of these, the 1962 Colonial Trail. (The yearbook’s namesake is the section of state highway 10 as it passes through Surry County, where our school was located). As I looked through the 1950 and 1958 volumes, I recognized many of the students’ names as folks I came to know years after they had graduated high school. Just as with the music from that era, seeing the photos in these yearbooks makes me think of a “nicer” time in our country. The students seemed more innocent in a way, and much more respectful of themselves and others. 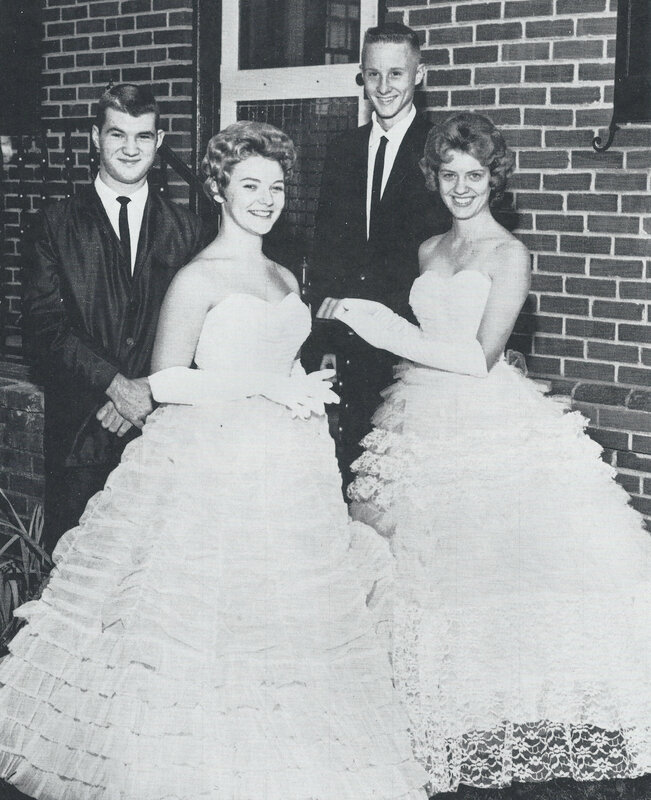 For example: this photo of the 1962 May Queen and her court. The girls look so graceful in their beautiful evening gowns and long gloves. And the guys look proud to be escorting the queen and princess. I was pleasantly surprised when I realized that the lovely young lady on the right is my friend, Linda, whom I came to know about 15 years ago. I’d say she was the perfect choice for May Queen. See? You just never know what treasures await you on E-bay. One of the top hits of 1962 was this instrumental by Acker Bilk. Listen and be taken back to a simpler time. This entry was posted in Days at Home and tagged colonial trail yearbooks, ebay, treasure hunting. Bookmark the permalink. Definitely one of my fave songs of the era…..what great finds on eBay. You don’t have to be in an antique shop to find treasures from the past do you! I think you’ve found the best treasures on ebay that anyone could. Your wedding dress was gorgeous and looked as if it was made for you. And who else could find a perfect buffet (is that what it’s called??) and have a husband willing to go several states to pick it up and bring it home!!? I am sort of a chicken or a bit intimidated by eBay! CH has wanted to sell a few things on there but we always wimp out. I think the yearbooks are a great find! Good Morning! What fun you actually found yearbooks. You really can find everything. E-bay really is our country’s attic. I agree with you. I’ve often thought I was born in the wrong time period lol 🙂 I love their dresses! I love ebay. Like you, I have gotten such a wide range of things on ebay. What fun to find yearbooks. Such a great way to reminisce! That is so neat that you found those on eBay! We have been selling on eBay for over 13 years now! The link to our store is in our sidebar on our blog! Ebay is great , and a great find here! And I’ve got a an Acker Bilk record spinning right now in the shop ! I, too, am a chicken when I come to eBay, but my daughter is a whiz. Great find with those yearbooks! Dianna, what a find on ebay. That picture looks familiar to me. Can you tell me Linda’s last name and the others? 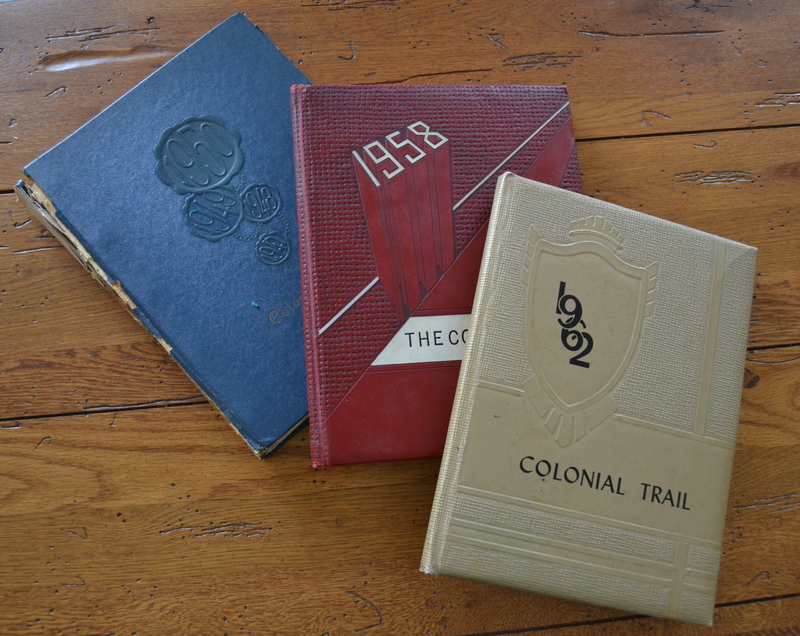 I have a few Colonial Trail years books that I need to find. The young man on the left I think was a Rowell, but not sure. You are so right about that was a gentler time. You picked perfect music to go with it. I too did not know you could get stuff like that on Ebay. and I love love love the picture–the dresses and especially our friend Linda and the other beautiful girl taught us swimming lessons at the Surry pool! That brings back a lot of memories…especially the gowns. Loved, loved that time and how we dressed and acted. Wish we could take some people back in time to show them what it was like to have respect for elders. I would never have thought to look for yearbooks on eBay. Did you know Linda was May Queen before you received the yearbook? No, Patti! I had no idea. Linda and I met when we were co-workers 1997. We only worked together about 3 years, but have remained friends since then! That was a lovely surprise, then.